When it comes to worker safety, mitigating downtime, and boosting productivity, nothing is faster than right NOW. Organizations across various industry segments — construction, food and beverage, chemical and industrial, and transportation equipment manufacturers — are juggling a mix of communication devices, slowing response times. Gaps in coverage, poor battery life and aging equipment reduce your ability to safely and efficiently meet production deadlines. The power of NOW puts instant communications at your workers’ fingertips — because when communication slows, production slows. Manufacturers today are under immense pressure to produce goods safely, efficiently and profitably. Meeting these goals requires reliable, clear voice and data communications. So the production line is always moving. So well-executed logistics exceed expectations. So materials and operations are tracked to maintain efficiency. So your most valuable assets — your people — are safe and connected. 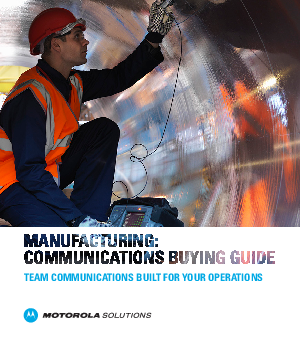 Unified team communications strengthen worker safety and help efficiently meet deadlines for various types of manufacturers today – but which solutions are right for your specific priorities and needs? This guide will help you choose the solutions that are right for your business. With a custom unified team communications solution designed around your business, you’ll have the power to eliminate the barriers between devices, networks and locations. Now everyone can be part of the conversation.